A 77-year-old woman was admitted for gum bleeding and progressive leg edema. She had a history of type 2 diabetes mellitus, hypertension and remote ischemic stroke. She was taking warfarin for chronic atrial fibrillation. She was malnourished but had no history of alcohol abuse. She required full assistance with her activities in daily life because of dementia. On examination, she was disoriented but alert. Bibasilar rales, increased jugular venous distention at 8 cm H2O and leg edema were noted. Laboratory examinations showed a serum sodium level of 100.8 (normal 133–145) mmol/L and a prolonged prothrombin time with an international normalized ratio (INR) of 3.32. Because her INR was higher than the therapeutic range, she was given vitamin K and the gum bleeding resolved quickly. The patient was given an infusion of hypertonic saline (3% sodium chloride) and her intake of fluids was restricted to treat hyponatremia presumed to be related to heart failure. Her serum sodium level increased at a rate of less than 0.5 mmol/L per hour, except for the period from the 30th hour to the 36th hour, during which an increase of serum level of 11.5 mmol/L (equivalent to 1.9 mmol/L per hour) was noted. The serum sodium level increment was then kept at a rate of 0.5–1.0 mmol/L per hour thereafter. At the 60th hour after infusion, the patient became comatose, with a serum level of 127.5 mmol/L. 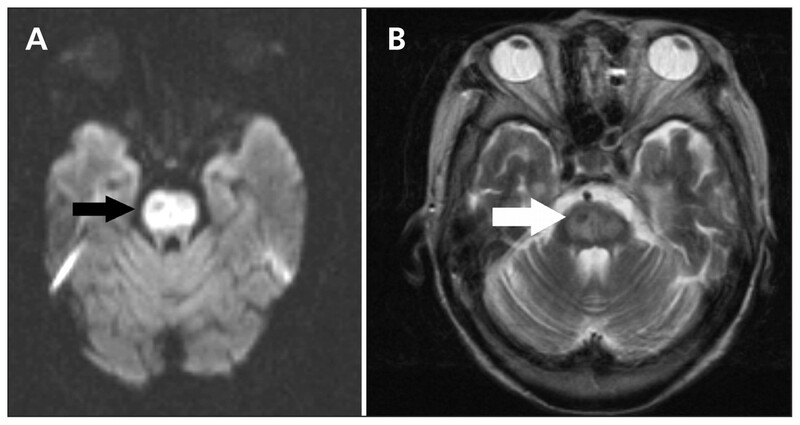 Magnetic resonance imaging of the brain showed the classic appearance of central pontine myelinolysis, with a hyperintense lesion in the pons with sparing of the ventrolateral and corticospinal tract on T2-weighted images (Figure 1A) and bright high-signal intensities in the corresponding area on the diffusion-weighted image (Figure 1B). The diagnosis of central pontine myelinolysis was made based on the typical clinical manifestations and appearance on the imaging studies, and on the exclusion of other plausible causes such as medications, stroke or other biochemical imbalances. Magnetic resonance images of the brain of a 77-year-old woman with central pontine myelinolysis showing a hyperintense lesion in the pons (arrow) with sparing of the ventrolateral and corticospinal tract on a T2-weighted image (A) and bright high-signal intensities in the corresponding area (arrow) on the diffusion-weighted image (B). Central pontine myelinolysis was first described by Adams and colleagues in 1959 in a clinicopathologic study with alcoholic or malnourished patients.1 Chronic alcoholism, electrolyte disturbances and liver transplant are associated with an increased risk of central pontine myelinolysis, and it may occur after rapid correction of hyponatremia.2 Decreasing levels of consciousness is the most common manifestation of central pontine myelinolysis.2 Other symptoms include horizontal gaze paralysis, pseudobulbar palsy and quadriplegia. Magnetic resonance imaging, particularly with diffusion-weighted images, can be very helpful in early diagnosis. The prognosis is generally poor,1,2 as in this patient, who did not recover from the coma. In severe hyponatremia, the rate of correction with saline infusion should be cautiously adjusted according to the rapidity of its development and severity of symptoms3 to avoid development of central pontine myelinolysis, especially in those with risk factors.
. Central pontine myelinolysis: a hitherto undescribed disease occurring in alcoholic and malnourished patients. AMA Arch Neurol Psychiatry 1959;81:154–72.
. Osmotic demyelinoation disorders: central pontine and extrapontine myelinolysis. Curr Opin Neurol 2000;13:691–7.